Although most people believe this is an effective way to maintain oral health, particularly when gums are injured, there has been an absence of actual evidence to suggest this does anything other than offer a brief sensation of relief (which admittedly may be enough). But last week, science finally caught up with grandma. When it comes to health, there are two streams of advice. The first is medical in nature, held true by doctors and supported by clinical trials and years, if not decades, of evidence. The other can be best described as the "grandma" approach. There's little to no information on the mechanism, clinical evidence simply does not exist and most likely no support comes from medical professionals. Despite this imbalance in scientific validity, in many cases, Canadians will choose grandma over GP. Why? Ask anyone and you'll probably hear: "The methods work." For anyone specializing in public health research, trying to justify using an onion inside a sock to help cure a cold, chewing raw garlic to clear a sore throat or drinking chicken soup to beat a fever can be quite a challenge. Over the years, researchers have tried to understand the mechanism behind these apparently effective procedures. The answer usually lies in the chemical composition of the natural product. In all three cases, the plants contain chemicals with natural antimicrobial activity and as such, help the body to combat infection. Chicken soup also has anti-inflammatory agents to help calm down that fever. The number of activities given the scientific stamp of approval continues to grow. Yet, some have never been tested even though they have been used -- sometimes even by health professionals -- for decades, if not centuries. One example is gargling with salt water. Although most people believe this is an effective way to maintain oral health, particularly when gums are injured, there has been an absence of actual evidence to suggest this does anything other than offer a brief sensation of relief (which admittedly may be enough). Their results once again revealed the validity of traditional practice in our modern lives. But last week, science finally caught up with grandma. An international team of researchers published a laboratory examination of salt water on the cells inside the mouth. Their results once again revealed the validity of traditional practice in our modern lives. The researchers wanted to make sure the experiments reflected real-life situations, so they acted as tooth fairies in lab coats. Volunteers undergoing molar extractions provided their teeth to the team -- although there was no word on how much money they received in return. The teeth were brought back to the lab where the gum tissue was separated and cultured. These cells, known as human gingival fibroblasts, were then kept for use later on. The cells were then scratched to mimic injury in the mouth and then rinsed to leave an experimental wound. At this point, the gargling could begin. Over the next few days, the cells were subjected to various concentrations of salt water ranging from pure water (control) to a rather high (7.2 per cent), which is akin to brine. The cells were examined by microscopy for any signs of healing. When the data was analyzed, the results offered a rather surprising finding. Of the different concentrations used, the fastest healing occurred in the presence of 0.9 per cent and 1.8 per cent salt. The higher amounts seemed to have little effect. In a biological sense, this makes perfect sense. The fluid in our bodies contains on average 0.9 per cent salt. The addition of the lower concentration of salt water increases the amount of fluid needed for healing. Going any higher leads to a negative effect in which the body doesn't respond. But this wasn't the only goal of the study. The researchers also wanted to know the mechanism behind the healing. Although one might expect the body was simply making more cells faster with the saline rinse, the results suggested this wasn't the case. Instead, the healing cells migrated from dense environments into the wound zone. This balancing of cell density allowed for a more natural healing process. Going even deeper into the molecular realm, the researchers examined how the healing cells changed when they migrated. The group found the salt water appeared to increase the formation of proteins known to help attach cells together, known as adhesion. With each rinse, the cells made more of these proteins to ensure migrating cells would anchor themselves into the wound area and improve healing. For the authors, this study provided a mechanism to explain why gargling with salt water -- as long as it is not too concentrated -- can be helpful in oral care. While they focused on wounds, the results suggest this type of adhesion improvement can happen even when there is no injury. This may be able to help reduce the effects of other chronic ailments such as gingivitis. 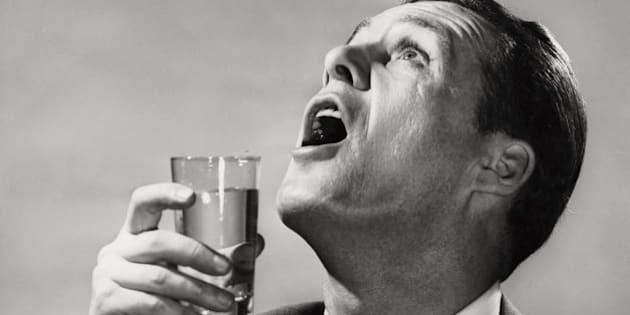 As for how to best gargle with salt, the researchers provided a recipe. Simply add one teaspoon of salt to one cup of water. Granted, this may not exactly match grandma's advice, but in this case you may have a justification. After all, she's still right, but now you're following the science to achieve the best results.